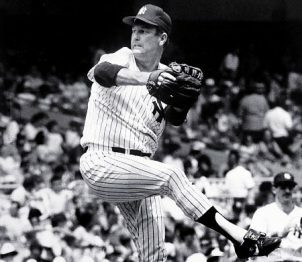 Tommy John pitched for the Yankees in all or parts of seven season. He is the last Yankee to win 20 games in back-to-back seasons (1979 and 1980). Tommy John is a borderline Hall of Fame pitcher, but mention his name and undoubtedly what will pop into most baseball fans’ minds is the surgery that now bears his name. Unlike Lou Gehrig, John has not been able to overcome the shadow of his medical-related namesake. Then again, that’s probably how it should be. After all, when Dr. Frank Jobe experimented on his left elbow on September 25, 1974, he not only added 164 victories to John’s career record, but probably added hundreds more to various pitchers throughout the game. Sadly, the reason Tommy John is on my mind is not because of his Yankee career, nor the many career saving surgeries done in his name, but because of the untimely passing of his youngest son, Taylor Simmons John, who died on March 9, 2010. I happened to be at Steinbrenner Field and was saddened to hear the news when a moment of silence was announced before an exhibition game against the Orioles. Since then, however, I haven’t seen a single mention of this tragic event. Unfortunately, Tommy John has been no stranger to tragedy. In 1981, just after the end of the strike and 7 shutout innings in his first game back, John’s other son, Travis, then two years old, fell from a third-floor window at the family’s New Jersey home. Travis plunged almost 40 feet. The impact was so severe that the young boy swallowed his tongue and then lapsed into a coma. He wouldn’t emerge from that coma until nearly three weeks later. Once again, the Johns were at the mercy of another miracle doctor, this time Dr. Fred Epstein, who would later serve as director of NYU medical center. Thankfully, Travis made a full recovery and walked out of the hospital on September 13. The next day, his dad recorded a complete game shutout against Milwaukee. Tommy John was traded from the Yankees in the middle of the 1982 season, but returned to the Bronx for the last four years of his career. Always fondly remembered by Yankee fans, the John family has also fondly remembered New York for the support and prayers offered during their time of need. 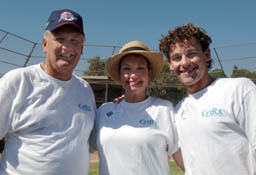 Tommy with his wife Sally and son Taylor during an ALS fundraiser in 2005. Taylor John was a teachers’ assistant in Lake Forest, Illinois as well as an accomplished Broadway singer. He was also a regular singing the national anthem in ballparks around the country. According to press accounts in his hometown, he died as the result of a seizure and heart failure because of an overdose of prescription drugs. It would be nice if the Yankees hold another moment of silence on Opening Day, and even nicer if they invited Tommy John to throw out the ceremonial first pitch. Almost 30 years ago, Yankee fans were able to console the John family during a difficult time. It would nice if they had the chance do the same once again. Tommy John is a very decent man, and I grieve with him. He did a very kind thing for me at work in ’03….at the time, I did not know who he was, and it was obvious, but he did not care. Thanks for sharing that experience with John. It is always reported that he is a truly good man. The loss of his son was very tragic. I really hope the Yankees do something today to honor him. Tommy John wasn’t a “borderline” pitcher; he was one of the greats.